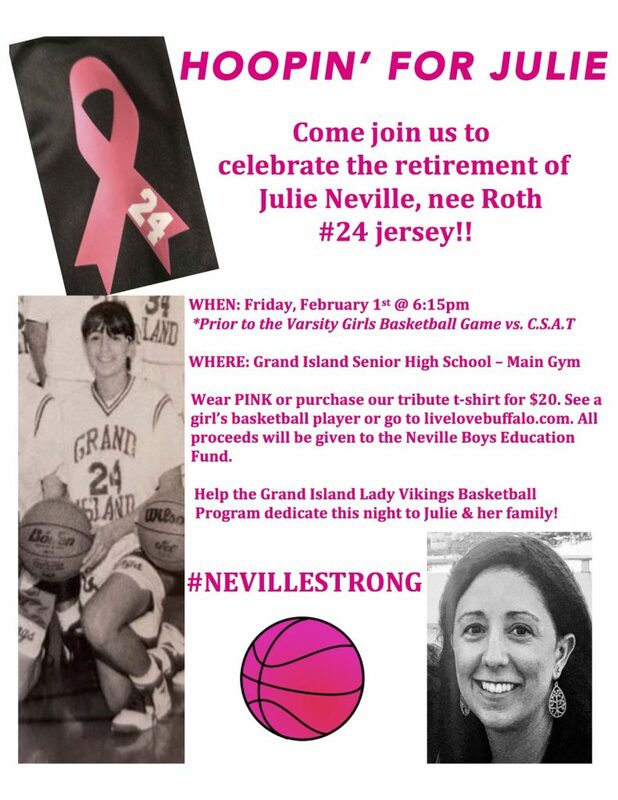 The girls basketball team is celebrating the playing and coaching career of a beloved teacher, coach and community member who lost her battle with breast cancer in October, Julie Roth Neville. She was #24 and we will be retiring her jersey in front of her friends, family and GI community at our home game February 1st at approximately 6:15pm (in between the JV and Varsity games) vs. C.S.A.T. Julie left behind four beautiful boys who are extremely young, therefore, all proceeds from the shirts and anything else done at the game (50/50) will be donated to the Neville Boys Education Fund. Both our JV and Varsity teams are running this event, there are 27 of them. The girls have been promoting the event on their social media sites, through email and text messaging. Some girls have been walking door to door promoting the event and selling t-shirts. We have others in charge of the excel sheet and inputting all the new orders from day to day. We also have a treasurer and secretary. The girls have written up their own announcements and have been spreading information in the morning speaking on the loudspeaker. The girls are each putting in approximately 5-10 hours a week depending on their responsibilities. This is our 3rd week promoting the event and have 2 more left. Total the girls will have approximately put in a little over 1,000 hours as a group. In addition, some of our fellow Niagara Frontier League competitors added events to their schools after hearing about ours. All proceeds from each event went to the Neville Boys Education Fund. The schools that did this were Niagara Wheatfield (raising $6,000), Kenmore East & Kenmore West (raising $4,000), Charter School for Applied Technology and Lockport.